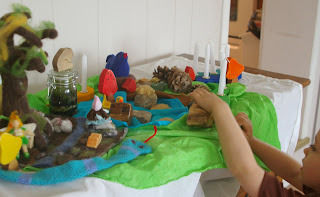 I'll be the first to admit that I struggle with keeping a nature table. I LOVE the *idea* (a central place created to reflect the seasons and their celebrations to keep them present in our home and lives), the execution gets muddled (and cluttered) at our house. But we keep trying, because, best of all, Rowan enjoys it and finds meaning in keeping it up to pace with the changes in nature around us. We have relocated to a hutch-top in our new 'art room'. With a step stool in front of it Rowan can happily access and play at the center. I dream about a gorgeous wall hanging of the four seasons on the empty wall behind the hutch, but the space is also our sun room and with its full southern exposure, any hanging I would want (wood? wool? silk?) would be devoured by the sun in months. So I am toying with something more moveable~ perhaps some of our own art work (relocationg our art display line). Ideas welcome! 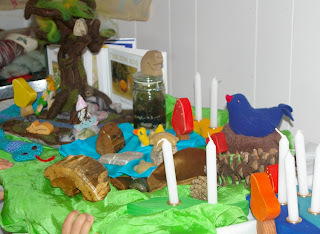 With our nature table (everyone does it differently~ children's ages and interests dictating!) we tend to combine favourite stories with toys and found items from nature so that the whole space is play-able. Rowan does best with a 'theme' or stage for play, so we create a playscape filled with inviting natural objects and ideas for the season. This way, while out and about or seeking a craft indoors, she often thinks of things that would go on the nature table, keeping us in tune with the season! With the lake opening after the winter ice and the remergence of life around us, this spring our table has a pond with lots of critters. 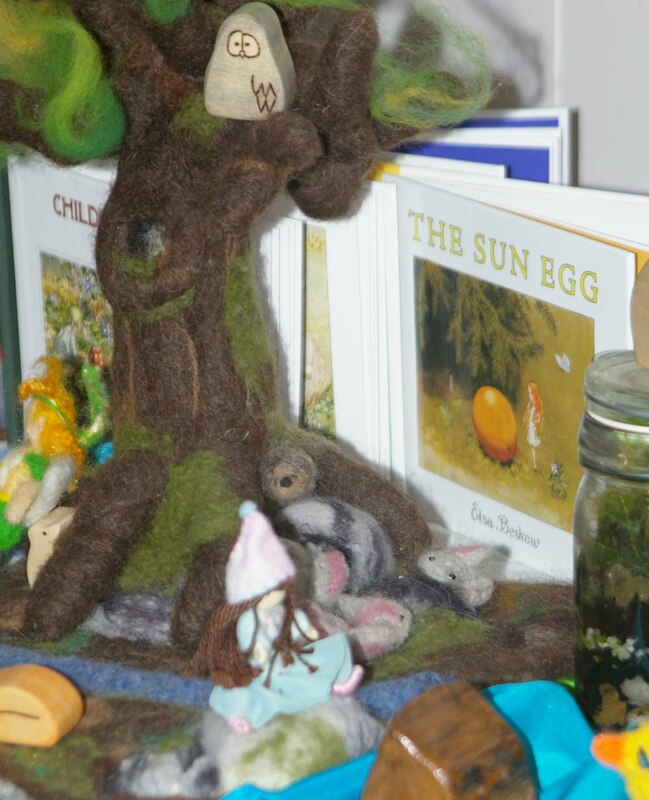 It also has our 'Four Seasons' tree (made by me) populated with baby animals exploring their new environment. The candles are a bit of a hassle, but Rowan was reluctant to pack away her new birthday ring until birthday time. 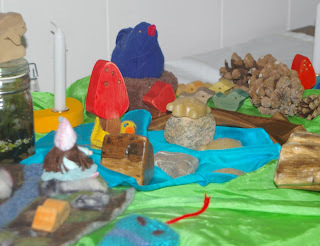 Other highlights include beeswax turtles, felted bunnies and hedgehogs, a terrarium and a couple of special stones, including 'Fruit Shell' the snail (really a stone, but you would swear it was a snail shell!). 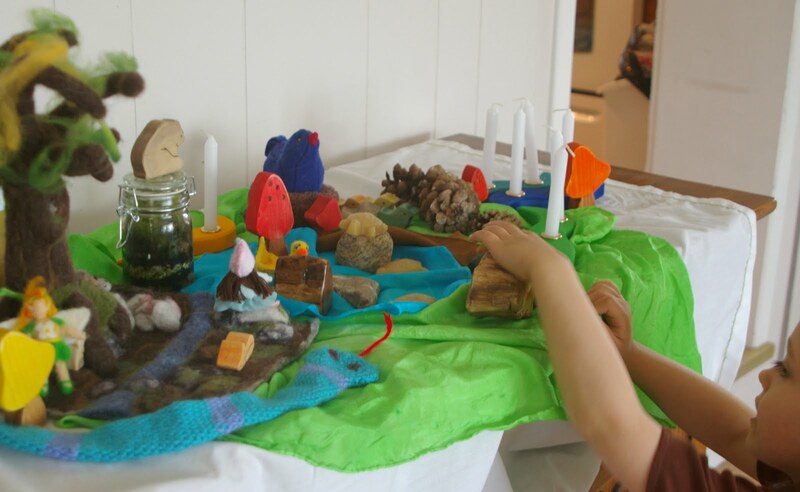 We are so grateful to the many talented artists whose handcrafted creations colour fill our table and play time with joy and beauty! A few represented here include: Mama Kopp, Plain Baby Jane, Princess Nimble Thimble, and Do Hickies & Thingamajigs. Silks, toadstools and felted tree-scape are mama-made additions. how did you felt your tree? i d love to know. hope i win one of those silks! !